Bougainvillea, named for a French navigator, is a native of South America and is grown out doors extensively in the warmer climates of the United States. It is a member of the Nyctaginaceae family with close relatives being the four o'clock and the sand verbena. Bougainvillea is an evergreen vine which is just as happy spreading horizontally or hanging downwards as it is climbing upwards and will makes itself at home in almost any situation as long as it is provided good drainage. 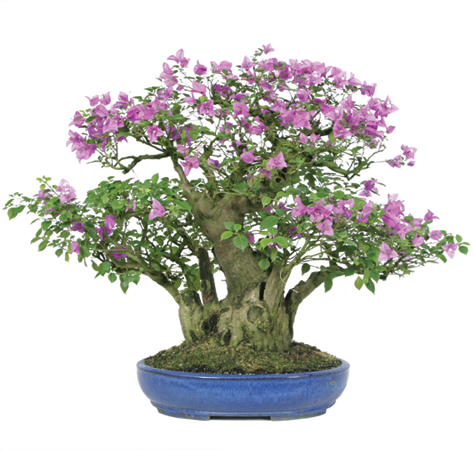 Bougainvilleas are moderately difficult to care for, but they are also beautiful, fast growing and ideal for bonsai. The colorful, papery "blooms" of the Bougainvillea are not flowers; they are bracts. The true flower is white, trumpet shaped and almost unnoticeable within the bracts. They flower most heavily in winter and early spring, but some varieties put forth scattered clusters all year. The colors are found in tones of purple, lavender, carmine, scarlet, red, pink, orange, yellow and white. Single and double flower forms are available. Double forms tend to carry their blooms near the end of the stems rather than distributing them evenly over the plant. Bougainvillea leaves are heart shaped and the bark is rather interesting and gnarly. Being a tropical plant, Bougainvillea will thrive outdoors in warm weather, but they must be provided with winter protection. Bringing your Bougainvillea indoors during cold snaps and winter weather dipping below 30 degrees will ensure survival. Bougainvillea love the sun, but be careful not to leave it in the intense heat of late afternoon summer sunlight. In the winter when sunlight is minimal try keeping it in a greenhouse setting, or in a window with southern full sun exposure. Bougainvillea will thrive outdoors in warmer climates and enjoy 6-8 hours of sun a day. Bougainvillea Bonsai do not like to have wet feet. Overwatering will cause rot, fungal problems, insect susceptibility and death, so it is very important to water sparsely and ensure good soil drainage. Elevating the bonsai pot with pebbles will provide humidity and will ensure that you do not water log your Bougainvillea bonsai. Because Bougainvillea are tolerant to dryer conditions, they are suitable for individuals who travel or who are more likely to neglect watering their plants from time to time. Fertilize once in the spring and fall with low nitrogen, high phosphate organic fertilizer. The old established method of forcing flowers is to withhold water to a point of causing severe stress to the plant. Research at the University of Florida has found that plants flower best when given high nitrogen fertilizers and short day lengths (15 hours of darkness within every 24 hour period). Your Bougainvillea can be pruned nearly year round. If you plan to wire any branches take care in wiring older ones as they tend to get brittle with age, as such, it is recommended to wire branches while they are young and supple. The Bougainvillea takes well to pruning; a useful attribute in styling bonsai because it allows the individual the freedom to shape their bonsai in any form they wish. Because Bougainvillea generally blooms on new growth, each branch, as blooms begin to fade, should be cut back to a point somewhat shorter than the desired length. Seal all cuts to prevent rot. If rot is detected on your Bougainvillea, cut it out completely to prevent spreading. Bougainvilleas tend to be pest resistant as long as they are kept healthy and free from wet soil conditions. On a routine basis you should inspect the plant for any types of insects that could harm it. If the plant is primarily kept indoors be sure not to let dust or other particles settle on the plant as it could be harmful and result in your plant not thriving like it should. When a bloom fades out you have to cut the plant to the point that it is somewhat shorter to prevent rot. If your Bougainvillea is attacked by caterpillars or green flies use insecticide soap spray which should be applied weekly. This spray is not harmful to humans or animals. Bougainvilleas are easily grown from air layers, root cuttings and branch cuttings. Young shoots, a few inches in length, should be placed in sandy soil with bottom heat and light moisture. Half-ripened or old wood cuttings taken with clean, sharp scissors in six to twelve inch lengths may be rooted with a rooting hormone from April to June. Ensure that the cutting is not in wet soil or it will rot. Cuttings will be ready to plant in 7-10 weeks. Repot your Bougainvillea about every 3 to 4 years and do so in the spring. The size and age of your plant should help you to determine how often it needs to be repotted. Be mindful to not prune the roots too severely. For optimum color and health, place outdoors in full, direct sun, keep watering to a minimum (only when needed), and stay on a monthly trimming and fertilizing schedule. As one more point of interest, Bonsai, like people and animals, are sensitive to the effects of second hand smoke and will be healthier in a smoke free environment.